I’m a snack mix fiend and sometimes, when I’ve overdosed on my go-to version (Circles and Squares), I make a dessert snack mix that is most commonly known as White Trash. Combine the cereals and pretzels in a large bowl. Seriously, unless you want stuff ending up on the floor, you need a very large bowl in which to mix everything together. Melt the white chocolate in a double boiler, stirring regularly. 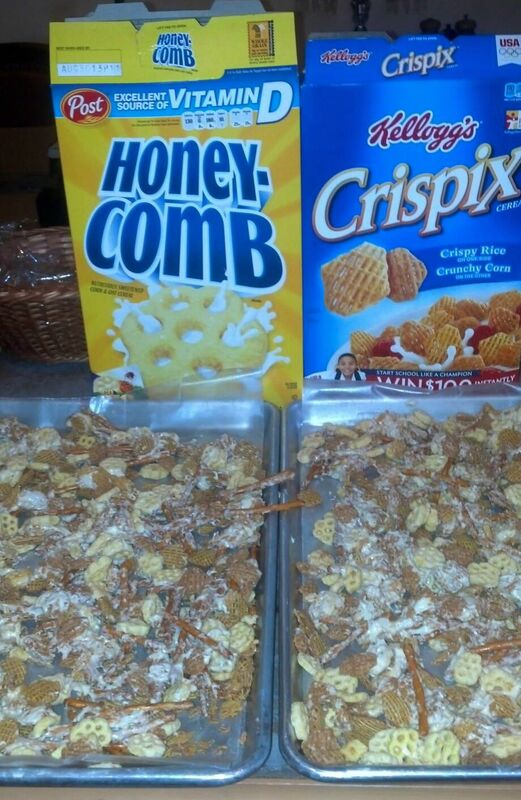 Pour the melted chocolate over the cereal/pretzel mixture and toss until all ingredients are covered with chocolate. Hands work better than spoons. Pour the mixture onto waxed paper and allow to set for 30 minutes, unless you live in an area of high humidity and you’ll need to wait a little longer. Break into pieces and store in a air tight container. trash so feel free to add in anything you’d like to eat with white chocolate coating. I’ve had several Pimm’s Cups over the summer and still find them amazingly refreshing. I couldn’t capture the flavor at home until I was making tzatziki and the thought struck me – grated cucumber! Peel, remove the seeds and grate one cucumber. Mix together Pimm’s and lemonade in a 12 oz glass. Stir in cucumber. Top off with Ginger Ale and ice. Stir. Garnish with cucumber spear. I was back in Lafayette for a meeting today and, as I still haven’t figured when I have to leave New Orleans to be on time but not too early, I was able to stop for breakfast. 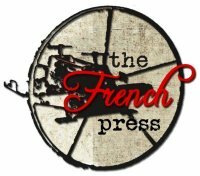 I had gotten a couple of recommendations so I decided to try the The French Press. It is located in a refurbished printing plant and has type drawers, letter trays and other decorations of its printing past throughout the place. I had the Sweet Baby Breesus breakfast. 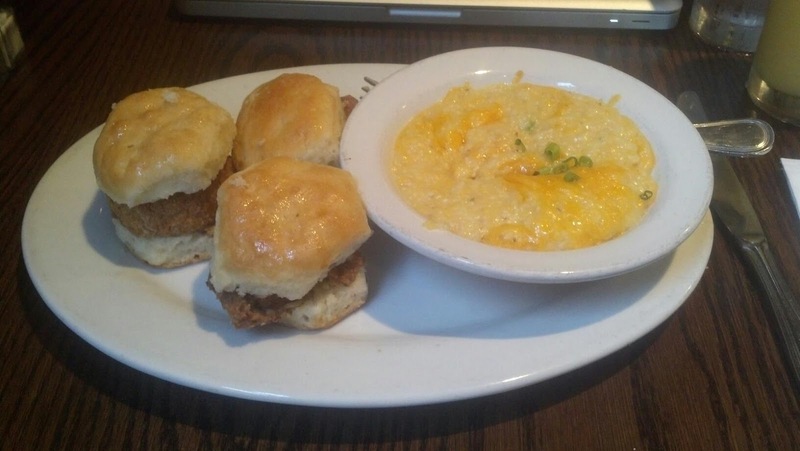 The meal was comprised of three buttermilk biscuit sliders with bacon, fried boudin balls and cane syrup served with cheddar grits. The biscuits were light as air and the salt from the bacon, combined with the heat from the boudin and the sweet from the syrup made my mouth very, very happy. Their wait staff was quick and efficient and I was able to enjoy my meal and make my meeting with five minutes to spare. As they also serve my absolutely favorite of Chicken and Waffles as well as cream cheese and banana stuff French bread and grillades and grits, I definitely need to make a few more trips west! Serendipity, in Mid-City, is the newest venture by Chris De Barr (most recent of Green Goddess fame). It is in the American Can Company building and right next to the Mid-City Library. The space is more industrial and much larger than Green Goddess. They accept reservations but we dropped in at 6pm without them and were seated right away. The selection of cocktails was pages long and we relied on the waiter for guidance for something sweet and cool. My dining companion choose one of their signature punches. Beautiful color and flavor and definitely tasted like more. I had been without soda for a week and had just picked up my car from the body shop, so I went for the house made Coca-Kola. It was a little dry from the extinct acid phosphate but still a good cola flavor. We decided to share Tuna and Watermelon Skewers as our appetizer (although we were both tempted by the pickled okra stuffed with pimento-jalapeno cheese). 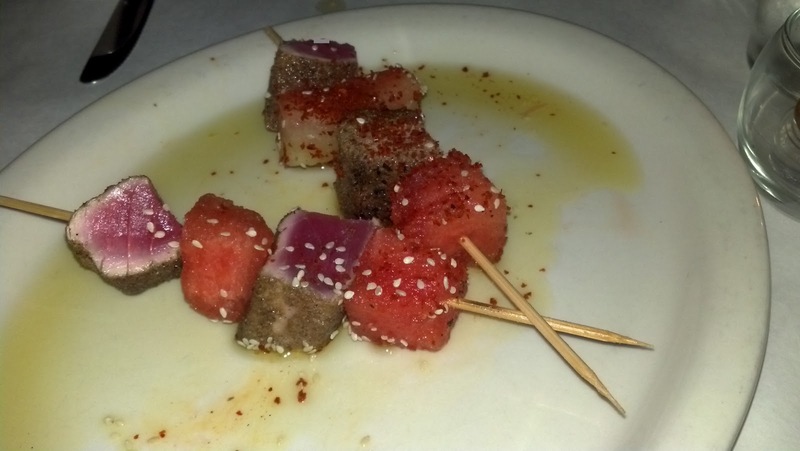 As you can see from the picture the tuna was perfectly seared medium rare and blended well with the cool watermelon. 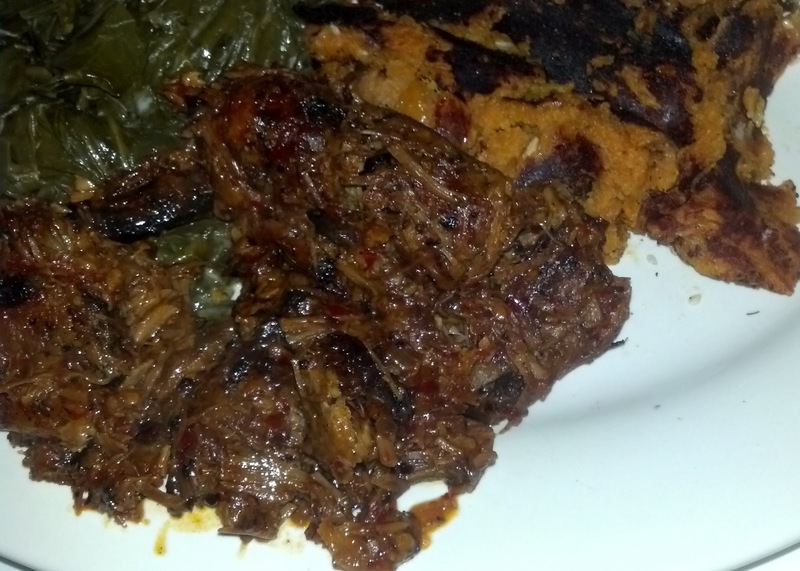 For the main course, I went with the Cochon de Lait/Lei – a banana leaf wrapped spicy BBQ pork with mashed sweet potatoes (it also came with collard greens but I pushed those onto Charlotte’s plate. The pork was absolutely delicious and paired beautifully with the glass of Sangiovese. She had the Malaysian Red Curry Goat Empanada with rutabagas and parsnips. 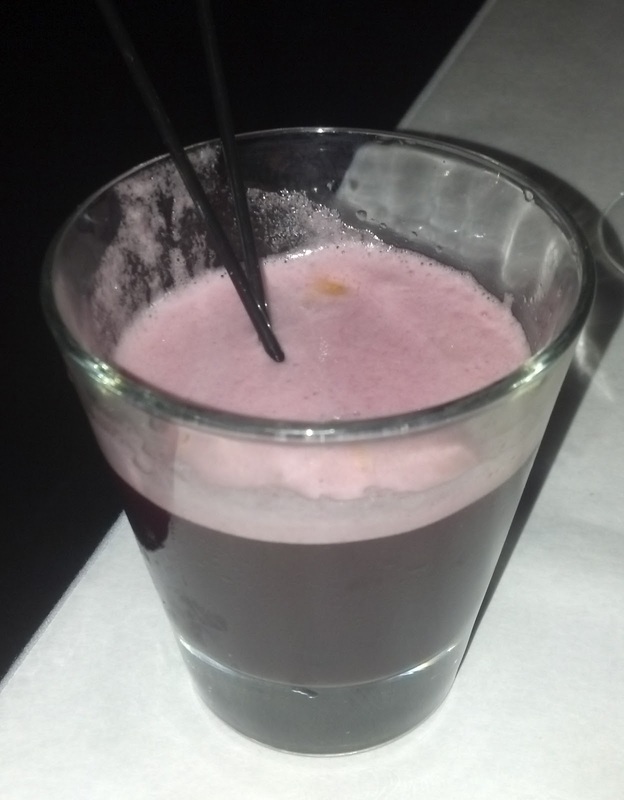 The combined flavors were very well balanced. If we hadn’t had dessert ready back at my place, there was plenty on the menu that we could have chosen from-especially the homages to Hubig’s Pie. I guess I’ll just have to come back soon. On Chris’ blog he writes about his new venture, “We bring the same sassy strut, the love of the unexpectedly beautiful, and the same flair for relentless creativity that has been my calling card as a chef for these many years.” As he moved around the tables, talking to guests, you could definitely hear that love in his voice.